برنامج استوديو حقيقي ذو جودة عالية كما يعمل على تحويل الملفات مع بسرعه رهيبه. The perfect addition to your home studio. 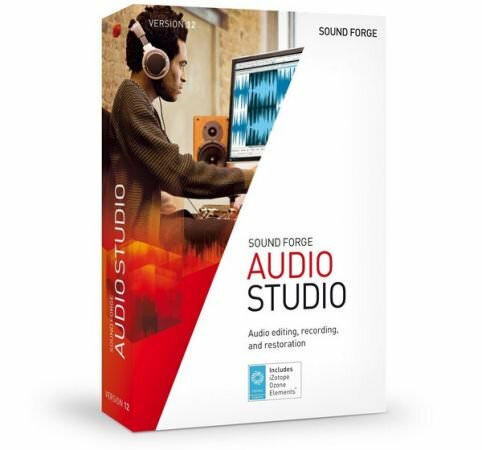 SOUND FORGE Audio Studio delivers the goods whether you are recording your band or podcast, digitizing your vinyl collection, creating SOUND effects for your new video, creating loops for your new tracks, or mastering your latest CD. Built on a 64-bit architecture to bring you more editing power, more processing power and a more powerful workflow. Cutting-Edge. Not only in Audio Editing. Enables you to continue to tweak your edit even after youve made your cut. Creates automatic, user-adjustable crossfades with each edit to guarantee smooth transitions between cuts with no pops or clicks. The new Vinyl Recording and Restoration interface makes it easier than ever to digitize your vinyl LPs or tapes and convert them to Audio CDs or popular formats such as WAVE, MP3, FLAC, and Ogg Vorbis. Use the Elastic Audio Editor to tune your vocals to a pitch-perfect performance. Achieve amazing results with complete control. Change the pitch without affecting the length of the recording. Perform frequency-based noise removal. Visually identify frequencies of an offending noise such as a chair squeak or cough in your recording, then use the spectral cleaning tool to select and remove the frequencies that make up those sounds. Automatically detect and remove clicks and crackle from vinyl recordings or other noisy environments. When the record level is set too high the Audio may clip, and cause distortion. Use the DeClipper to restore and recover analog or digital material with clipping artifacts. Reduce the excessive prominence of sibliant consonants, such as "s", "z" and "sh", in voice recordings. Easily remove unwanted hiss when digitizing archival tape-based recordings or hiss from a guitar or bass amp. Easily clean up background hiss with pre-sets for hiss behind vocals, cassette tape hiss, analog tape hiss and more. SOUND FORGE Audio Studio includes a set of professional effects to inspire your creativity, including Chorus, Flanger, Delay, Distortion, Amplitude Modulation, Dynamics, EQ, Gate, Limiter, Resonant Filter, Reverb, and Stutter. Easily create a podcast or DJ set. Whether your source is a microphone or the line out of your turntable rig, the editing tools, filters and effects in SOUND FORGE Audio Studio make it easy to record and produce the perfect performance. Then render it to any of the popular streaming formats to upload and share with the world. Capture your performance Plug a microphone into your computers Audio card and capture your performance in high-fidelity with resolution up to 32-bit/384kHz.